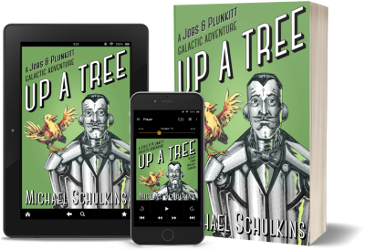 A planet on strike, an alien love triangle, and a giant politician-eating artichoke: Galactic Senator Plunkitt is, literally and figuratively, up a tree. The trouble began when Plunkitt's old school chum Flotsam Drang--a startlingly malodorous Denebian with an insatiable appetite for the pleasures of the flesh--set his eye-stalks upon the worst possible paramour: the secret tweet-heart of the planet Tree's most powerful bird. This unlikely rivalry soon draws Plunkitt into a thicket of insider trading schemes, labor negotiations, and political skulduggery as dense and impenetrable as the rapacious jungles of Tree itself. But it's the Senator's own knack for turning a bad situation worse that lands him, Flotsam, and Tree's favorite tweet-heart in deadly peril. Naturally, it falls to your humble narrator Jobs, armed only with a million-credit brain and a ten-credit weed-whacker, to untangle the threads, rescue the Senator, and deliver the planet Tree from itself. Enter the UP A TREE giveaway! 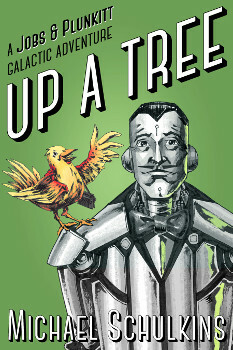 UP A TREE has just come out as an audiobook! I'm giving away FREE audiobooks and signed paperbacks - enter to win!